For days I bitched about Occupy DC’s participation in a rally for infrastructure spending with the SEIU, a bitching that hit a fever pitch after the latter endorsed Barack Obama as the candidate of the 99 percent. But I’ll tell you what: I can’t give up a good opportunity to protest and a chance to open a few minds — or at least piss a few off. So, with pushing back against co-option on my mind, I decided I’d head down to Georgetown and the Key Bridge after all, but armed with a sign speaking for the 90 percent of the 99 percent who don’t believe the president represents their interests. I tend to prefer signs calling out the institutional problems with the system, not the personnel, but the SEIU kind of forced my hand. At one point as I held the sign out to traffic crossing the bridge, a Circulator bus full of commuters stopped, the driver opening his door to tell me “that’s not true, he doesn’t love war,” as he shook his head. I then explained that he had in fact doubled the troops in Afghanistan, killing thousands of civilians and — knowing my audience, this being America and all — more U.S. soldiers than in the eight years George W. Bush oversaw the occupation. I also mentioned the drone wars in Pakistan, Yemen and Somalia. A funny thing then happened. “Is that true?” the driver asked. A fellow occupier interjected: “Yeah, it is.” With a look of having genuinely learned something, the driver nodded his head. Wait, I thought, did I just have a successful political conversation with someone who started by hollering at me from his vehicle? Weird. Me: Obama’s foreign policy is the same as Bush’s. He has just expanded the war on terror. He doubled the number of troops in Afghanistan. No, he surged the troops in Afghanistan. Just like Bush. He has authorized more drone strikes in Pakistan than Bush did in eight years, killing thousands of innocent civilians. You’re wrong. He killed Osama bin Laden. He’s also killed U.S. citizens with drone strikes. Well, under the Constitution even traitors are supposed to have trials to determine they are traitors. Should we really trust one man to decide who lives or dies? So what would you have us do? I would have us pull all our troops out of every country and bring them home. Something like 95 percent of suicide attacks are the result of foreign occupations. You don’t see terrorists going after Switzerland. Well, that’s because they don’t have a military. As Upton Sinclair said, it’s difficult to get someone to understand something when their salary depends on their not understanding it. 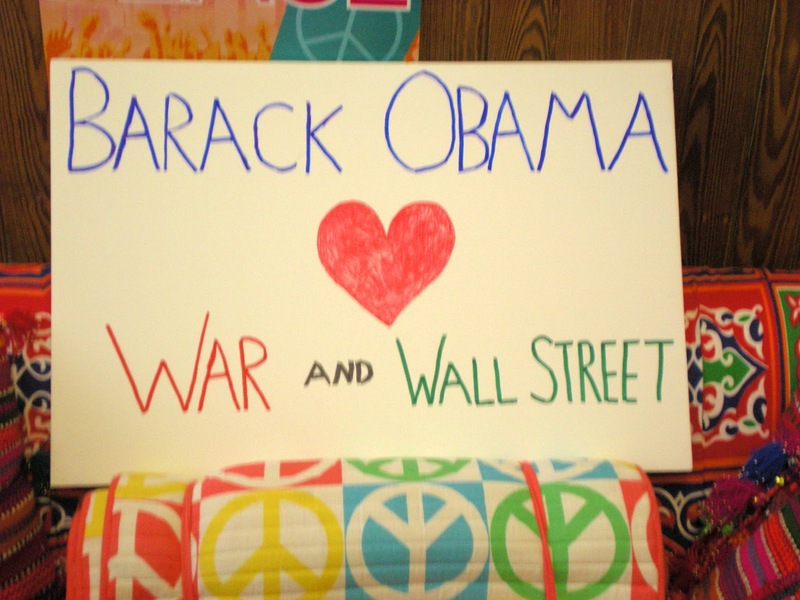 This entry was posted in Barack Obama, Military-Industrial Complex, Occupy DC, Occupy Wall Street. Bookmark the permalink. Awesome!!! I just wrote about 1-1 conversations on the previous post. I'm cool!I had a successful conversation with my brother-in-law a while ago. I asked him about Iran's nuclear program. He said the standard "they want a nuke and are close to getting one". I said no, IAEA inspectors are in country and continually say no material is being diverted to a weapons program. He said no way. I said yes. A google later and he was onto the truth. "Well, that's because they don't have a military. "I suppose not having a military was not even comprehensible to his brain. Was this guy from the action or just walking by? I think your military contractor *does* get it…he just doesn't realize that he does. I mean, exactly, they don't have a military! Brilliant plan, let's make implementing this anti-terrorism action plan a top priority. I swear, your discussion with the State Department lackey sounds just like the dialogue in one of the "American Radicals" cartoons over at VastLeft. And that's depressing. "And they were surprised I wasn't for more state intervention (Medicare, universal health-care, other social benefits). They were practically repulsed. "And the alternative solutions you put forth were? I didn't put forth any. Except to say that charities, churches and NGO's should step up to help impoverished Americans. My point was that expanding the federal government in the U.S. is always the wrong way to go. It's not true that Switzerland doesn't have a military – they have mandatory military service in fact. "Neutral" does not mean "no military"
Anonymous,While that is true, it does not have a military in the modern nation-state sense; it has a citizen militia that trains for truly defensive purposes only and which has never been deployed outside its borders.More to the point I was making by highlighting that part of the conversation: the State Department contractor immediately assumed Switzerland's lack of enemies had to do with its not having a military, yet couldn't seem to grasp my argument that military adventurism is what creates enemies for America.